What’s your personality like? Long before BuzzFeed or the Myers-Briggs personality test, there was phrenology—a pseudoscience that used the lumps and bumps of human skulls to tease out the secrets of human psychology. This skeleton-bedecked snuff box looks creepy, but it served as a handy reference for its 19th-century owner. Part of the collection of the Science Museum, London, it shows three views of a numbered skull on the lid and has a handy-dandy key on the bottom of the box. The concept behind phrenology makes a certain kind of sense: Since the brain holds the mind, different faculties of the mind must live in certain parts of the brain, or so phrenology’s followers believed. And while that’s not totally off base, they also believed that one could “read” the elevations and depressions of the skull for clues about the capabilities and “faculties” of the brain within. 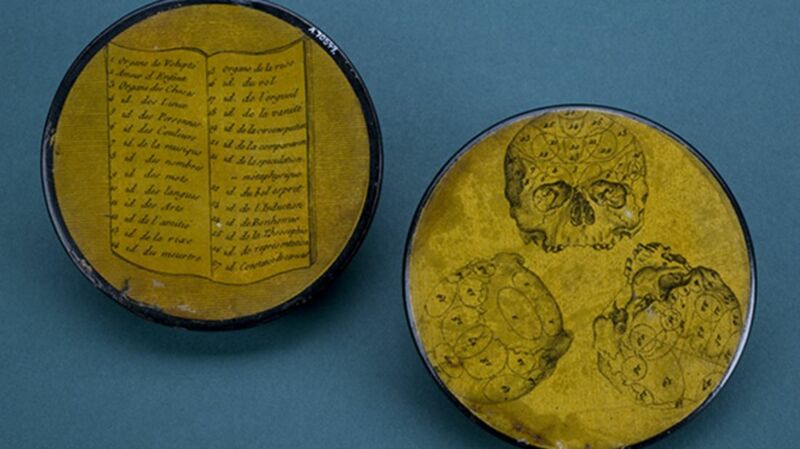 That’s demonstrated on this snuff box, which shows three views of a skull studded with numbers. Each number on the skull corresponds to an “organ” responsible for a personality trait. Number 18, for example, indicated vanity, so someone with a large or protruding area at that part of the skull would presumably be vain. There are 27 “faculties” or “organs” overall, each divvied up and named by Franz Joseph Gall, the German physiologist who invented phrenology. The sections cover the entire gamut of human emotion and behavior, from haughtiness and arrogance to poetic talent. Phrenology may have long since been dismissed as a pseudoscience, but it sure left some creepy memorabilia behind. Take the box in question: Made in France at some point between 1800 and 1830, it also jumped on another trend—sniffing snuff, or fine-ground tobacco. The practice was all the rage in Europe between the 16th and 19th centuries, and spawned not only elaborate snuff-taking rituals but a collecting craze. Today, snuff boxes made of everything from silver to papier-mâché are still prized collector’s items.